Cherry Costello’s life is about to change forever. She and Dad are moving to Somerset where a new mum and a bunch of brand-new sisters await. But Shay already has a girlfriend, Cherry’s new stepsister, Honey. The cover is so gorgeous and yummy. I love that some of it is illustration, but the pictures of the chocolate aren't! Mmm... I also love the silver against the bright red. It looks fun and entertaining, yet also sophisticated and.....well....chocolate-y! The whole idea of The Chocolate Box Girls is just genius. 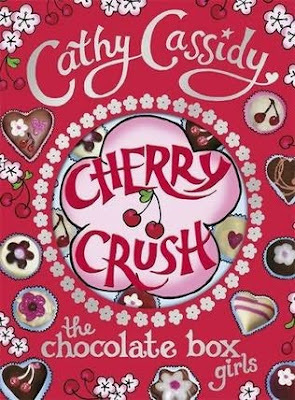 Apparently there will be five books in total (Cherry Crush being the first one), each book being from the point of view of each sister. This one is from Cherry Costellos. I love the way she looks at things, and yet I feel sorry for her sometimes too. Her stories are magical, and mysterious....love it! My overall rating of this fabulously amazbrilltastic book is 5/5! It has friendship, a gypsy caravan and chocolate....what more could a great book need? Sounds like an interesting read. Although, I don't read Cathy Cassidy any more, as I think all her books aree based on the same principle >_> (I found Jacqueline Wilson was like that too) It's a nice review, though!